Advantages: Fascinating era of changing fortunes, new technologies and tactical development; excellent profiles; interesting text; many relevant captioned wartime photos. The Classic Colours Jagdwaffe project is an ambitious series of books written by an ensemble cast of some of the best respected Luftwaffe experts from around the world. The focus of the series is the camouflage and markings of Luftwaffe fighter aircraft from the first tentative challenge to the Treaty of Versailles to the end of the Third Reich. "Jagdwaffe - Holding the West 1941-1943" describes the Luftwaffe fighter units allocated to defend France and the Low Countries during this crucial time of the war. The pilots on the Channel Front were so experienced and effective that the task of securing the English Channel was allocated to just two Geschwader. Although the focus of the book is, once again, camouflage and markings, the authors take the opportunity to paint the historical context behind the aircraft and their livery. 1941 to 1943 was a dramatic period in this theatre, with the balance of control of the air delicately poised. The introduction of the Focke-Wulf Fw 190 during 1941 was initially accompanied by technical problems but even so, the Wurger quickly established itself as the best fighter on the Channel Front, and it inflicted heavy losses on RAF aircraft in the area. The success of the Fw 190 encouraged fighter sweeps and low-level bombing attacks against British coastal towns. It took the RAF some time to come up with effective countermeasures to these sorties, and the response required massive resources. The book also covers the disastrous Dieppe landings of 1942, and the Luftwaffe's successful part in repelling Fighter Command despite being significantly outnumbered. The tables were turned again in 1942 when the US Army Air Force commenced its daylight bombing campaign using the B-17 Flying Fortress and B-24 Liberator. Text and images follow the see-sawing fortunes of the combatants over the ensuing year. Two Luftwaffe Gruppen were established in 1943 to conduct hit-and-run night raids, adding to the damage done by continuing daytime coastal attacks. Despite complications and problems associated with this difficult task for non-radar equipped day fighters, these raids did cause considerable difficulties for RAF Fighter Command. The interesting text is supported by more than 200 wartime photos. These are usefully captioned and highly relevant to the subject matter. 25 colour profiles are presented at page width, providing plenty of inspiration for modellers. These profiles document the transition of Luftwaffe fighter camouflage from 02/71/65 to 74/75/76 Greys; and reflects the introduction of the Fw 190. 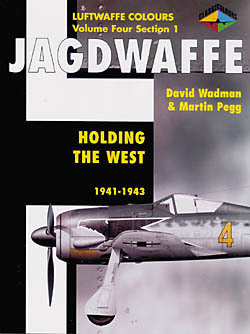 "Holding the West 1941-1943" is another terrific instalment in Classic Publications' Jagdwaffe series.